Hi friends! 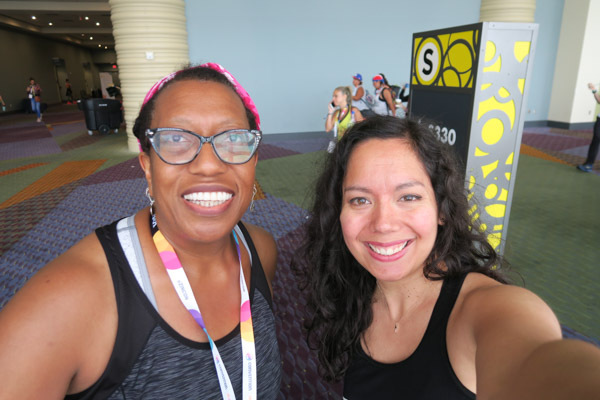 I’m still living in that post-ZinCon glow and loving working on these Zumba Convention vlogs and blog posts for you. 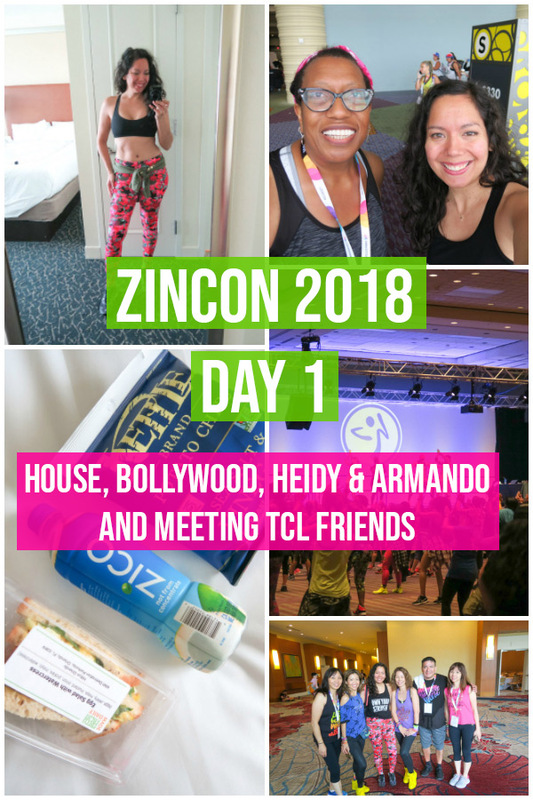 Here’s my ZinCon Day 1 blog post and vlog where things really get kicked off and sessions begin. Let’s jump in, shall we? I was a little disappointed with breakfast at the Hilton this year. The whole process was a bit slow (every morning), and they weren’t able to customize sandwiches from the menu. 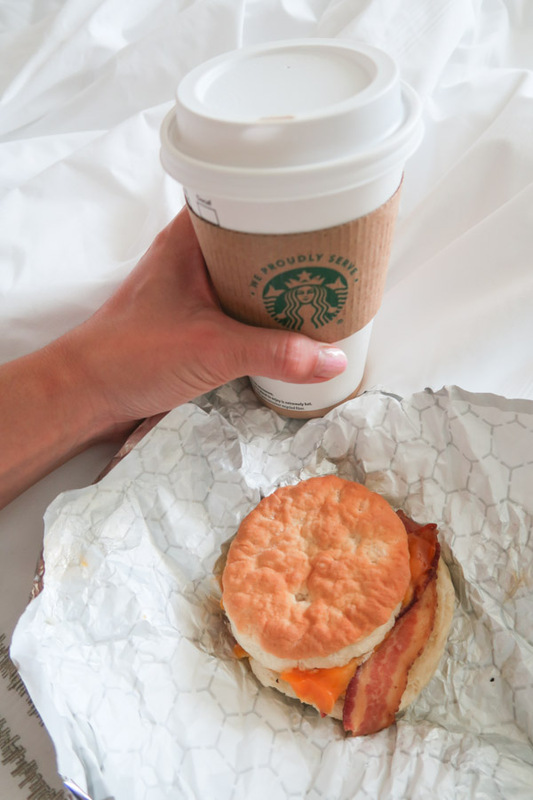 Last year I’d get an egg and cheese English muffin, but they didn’t have that on the menu and weren’t able to customize because they said the sandwiches were pre-made. Bummer. When I’m traveling, I tend to eat less meat because I’m trying to avoid conventional meat. Sometimes my comfort with things I’ve eaten historically makes me pick options even though they most likely have conventional meats. So on this day, I opted for the bacon, egg, and cheese. I totally forgot it was on a biscuit, which is too rich for a pre-workout meal IMO. Oops. 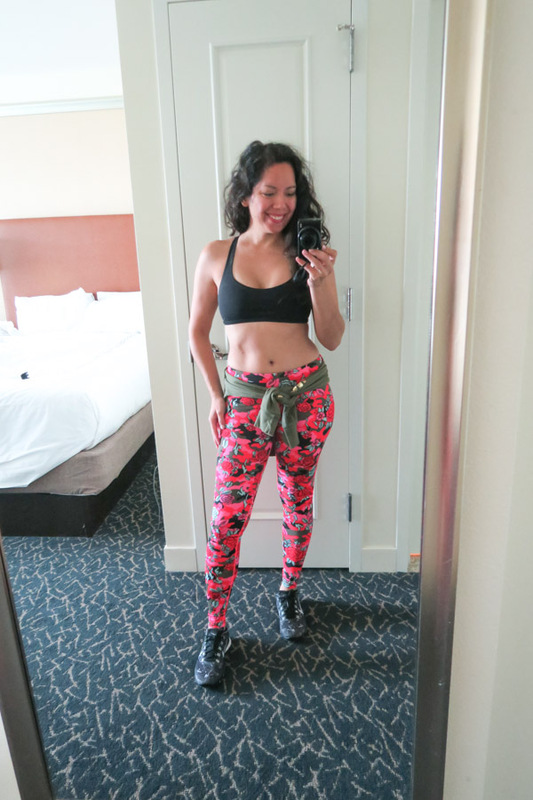 Here’s my Day 1 outfit: pink leggings purchased here at Convention, black sports bra by Lululemon, cardigan by Zumba (also from ZinCon), and shoes by Nike. This cardigan was my ride or die of this year’s event. I literally wore it every day after getting it. 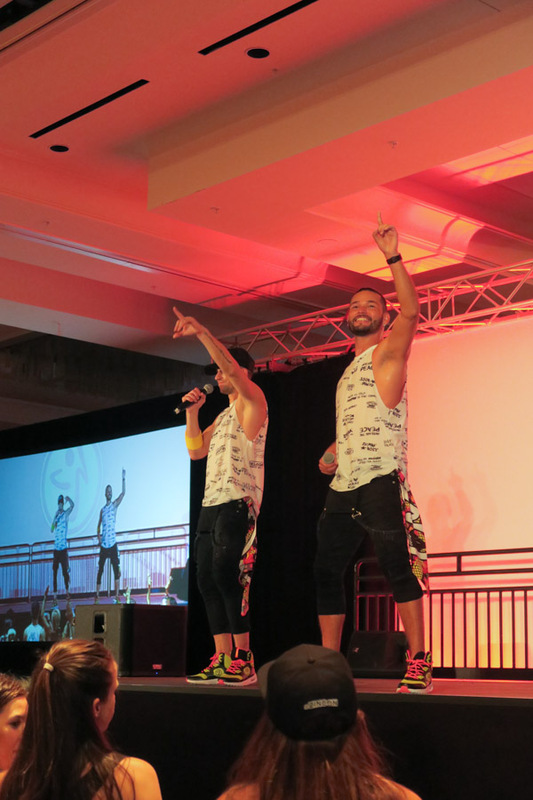 My first session of this year’s conference was House Experience with Benjamin and Rodrigo. They blew me away a couple years ago, and I’ve been super excited to return to this session. Their range of movement is so huge. I wish I could move as big as them. Not to mention their energy is through the roof. My friend Sara pointed out that they’re able to make even the broken down moves fun, and I totally agree. They’re super easy to follow, and you just have such uplifting fun dancing with them. 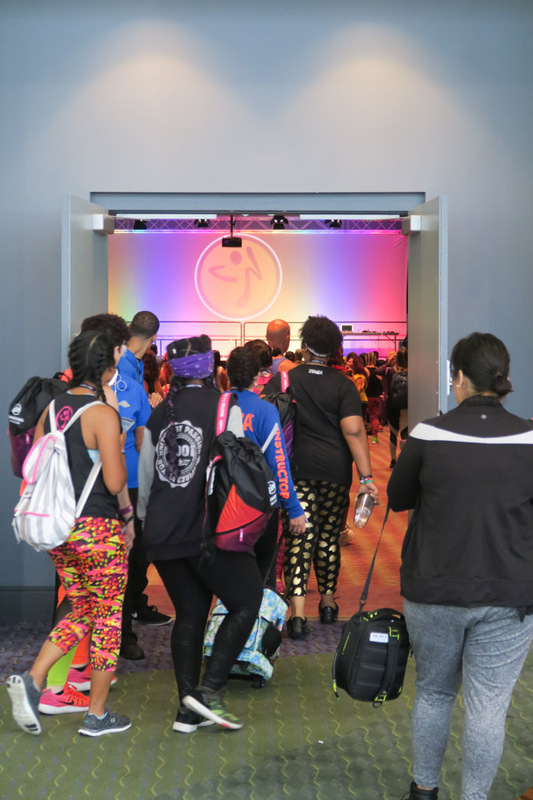 Attend this session if you’d like to see a masterful version of breakdowns, how to really pump up a class full of energy, and learn some fun house music choreo to incorporate into your classes. Michelle found me in the session and said she loves my site. Aww! She even pointed at her fingers and said, “Catbird!” Yes! Her bling was so pretty. I also got to meet some of Michelle’s friends, including Pablo. Group shot! To be efficient, I picked up these eats when I was at the shop at breakfast. And good thing I did because the line was super long when I passed it later. 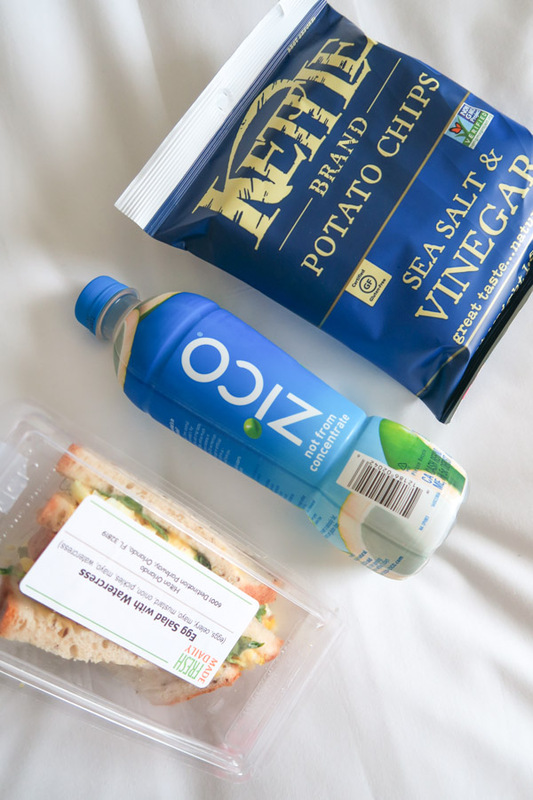 For lunch, I had the egg salad with watercress, salt and vinegar chips, and some coconut water. So lines stress me out, thus I usually avoid them. But they moved Bollywood Obsession back by 30 minutes from the originally scheduled time, and I didn’t notice the new time on the badge. Which is kind of funny since you have to use your badge to get the location. Haha. I ended up using the extra break time to find some space off to the side to do some stretching. 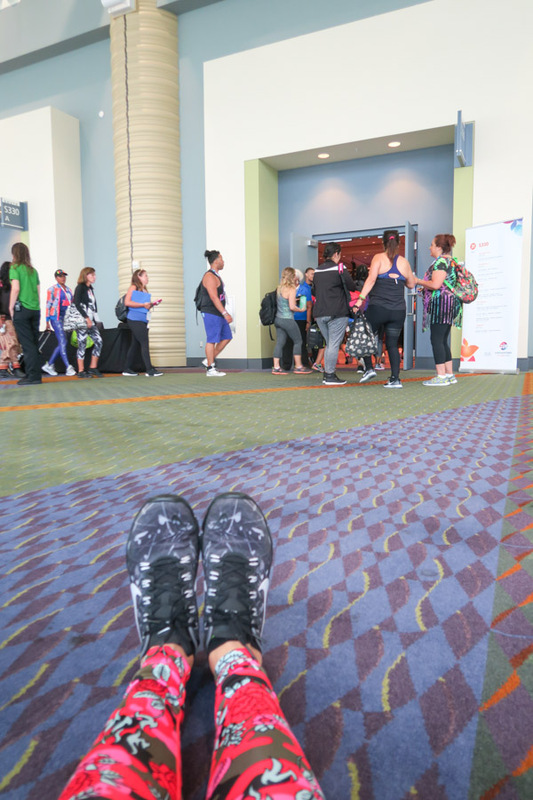 Whenever I’m at ZinCon, I’m always looking for windows of time where I can squeeze in some stretching. This really helps my back feel better, but I think is also great for keeping my body in good condition to participate in the sessions as much as possible as safely as possible. 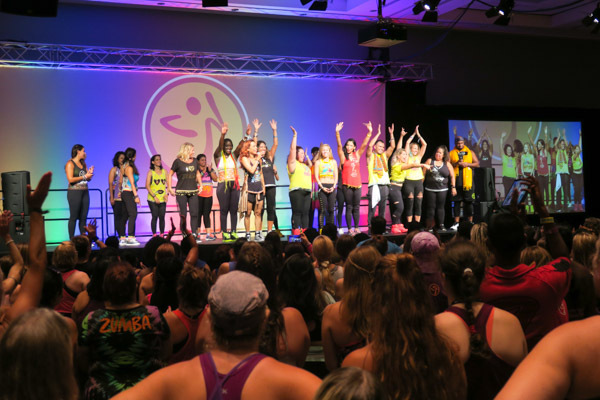 Love seeing that big, lit up Zumba logo in the background. You know something fun is about to happen! 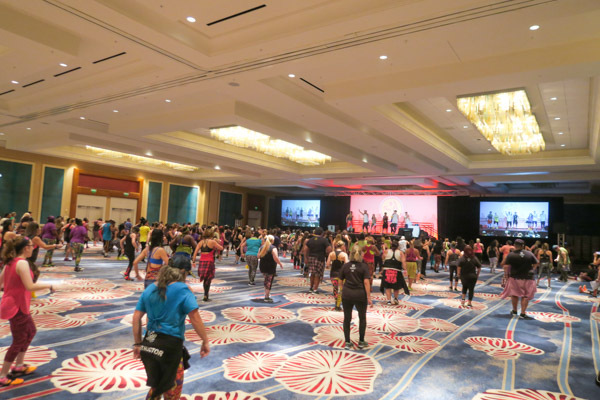 In the video I mentioned that I missed Bollywood last year, but I just checked my Zumba Convention page, and I haven’t been since 2014 when Sucheta first took over Bollywood from Dr. B. Yikes! What was I thinking? Bollywood is always one of my stand out favorites. And I absolutely love the fun ball of energy Sucheta is. She energizes the whole room! But I guess this is the challenge of ZinCon – balancing your favorites with trying something new. The struggle is real, peeps. Sucheta did a fun team-teaching style session where other ZES and ZJs from around the world helped teach class. It was one, big, fabulous, international party! The room was packed, and I just loved my time in the session. Definitely thinking to make it a point to ensure Bollywood is in my registration next year. By the way, if you don’t already follow Sucheta on YouTube, she posts a lot of her choreo there! My classes have always loved her stuff, and I’m excited to practice some of the new songs in this year’s session for when I start teaching again. Attend this session if you’d like to be filled with the feeling of true joyful dance and learn some unique and beautiful Bollywood (and even some bhangra) choreography. Sucheta’s session is magical. A couple people recognized me in the Bollywood session and introduced themselves saying they watched my ZinCon vlogs. Sooooo cool! 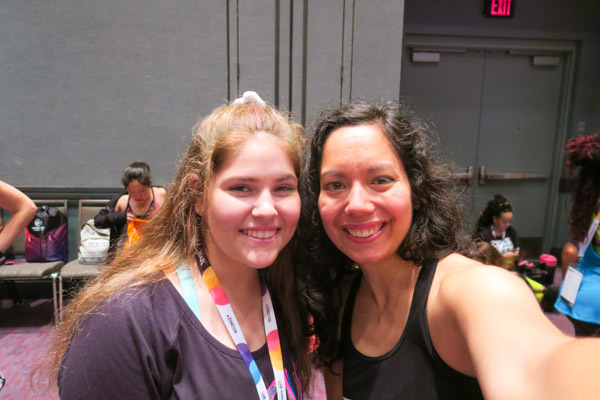 Guys, it’s my honor to make those videos for you, and it’s even cooler to meet some of you in person. Thank you SO much for introducing yourselves! This is Adriana from Louisiana! And say hi to Sheree from Texas! You can see both of them in the vlog too! 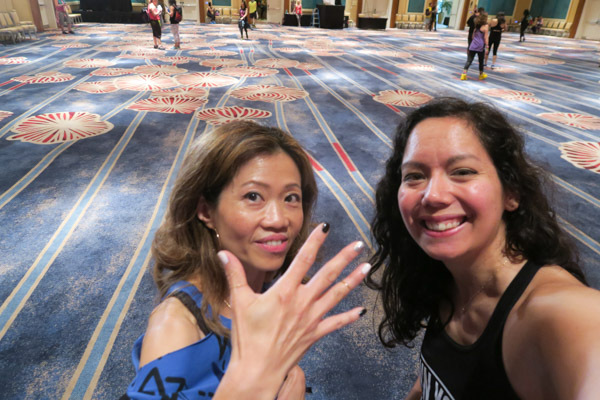 After Bollywood, I headed back to the room to do a final watch of my Day 0 vlog with Annette. 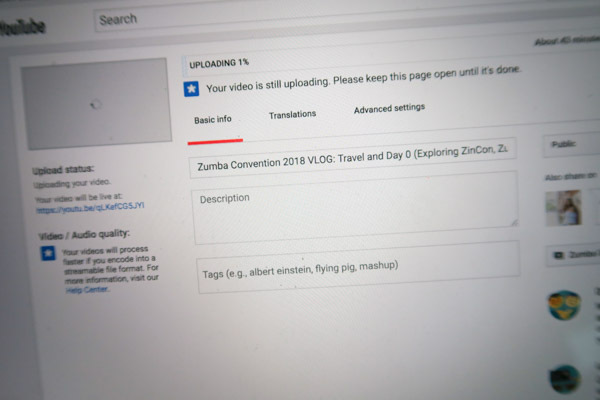 It takes me about 2-4 hours to edit one vlog. I edit the whole thing through and then re-watch it several times making edits here and there. Once I’ve finished what I think are the last edits, I always do a final watch to make sure I didn’t miss anything. We had some light snacks in the room while we watched. And I got the video uploaded before my last class of the day. Woop! Heidy and Armando led one of my very first ZinCon sessions back in 2011 – Caribbean Heat. I’ve loved popping in and out of their sessions over the years, and they always deliver. 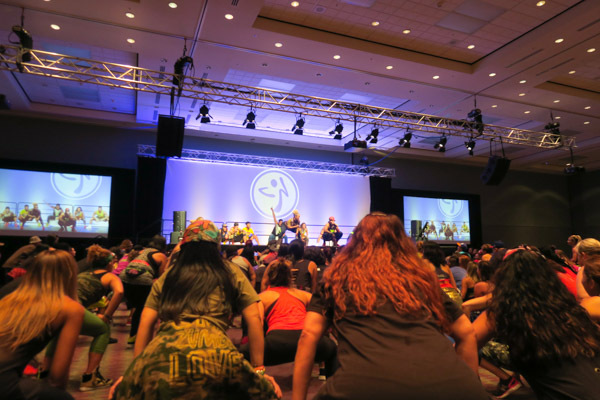 For my ZinCon newbies, the sessions are typically 2 hours while the master classes are usually 1 1/2 hours long. Heidy was super pregnant but still spent a good portion of class up and (safely) dancing. She and Armando did a little couples dancing for a quick minute that was super cute to see. And one of the coolest things about attending one of their sessions is that they often sing some of their original songs to you. Live!!! 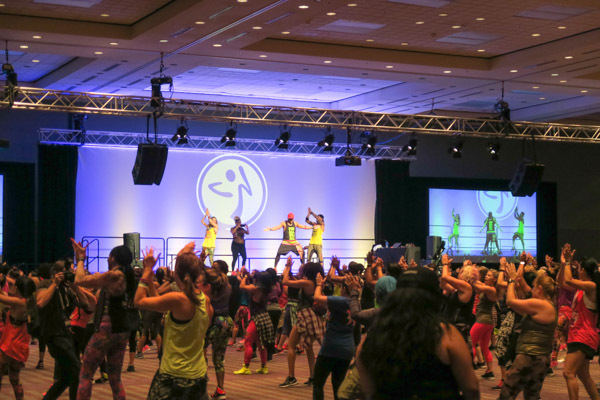 It’s just one of the many great reasons to attend Zumba Convention. 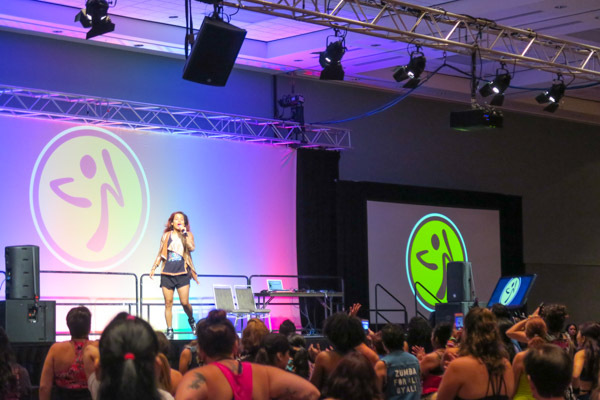 Attend this session for fun Zumba choreo (you can use more of these songs in Zumba versus some of the more flavor sessions since they tend to do more Zumba rhythm songs), to see a super cute Zumba couple, and to hear these talented musicians performing live. I was feeling comfort food, so I opted for the grilled cheese, which normally comes with tomato soup. They were out of the soup so I got fries, which was kind of funny since I’d been telling Annette that I was craving fries. 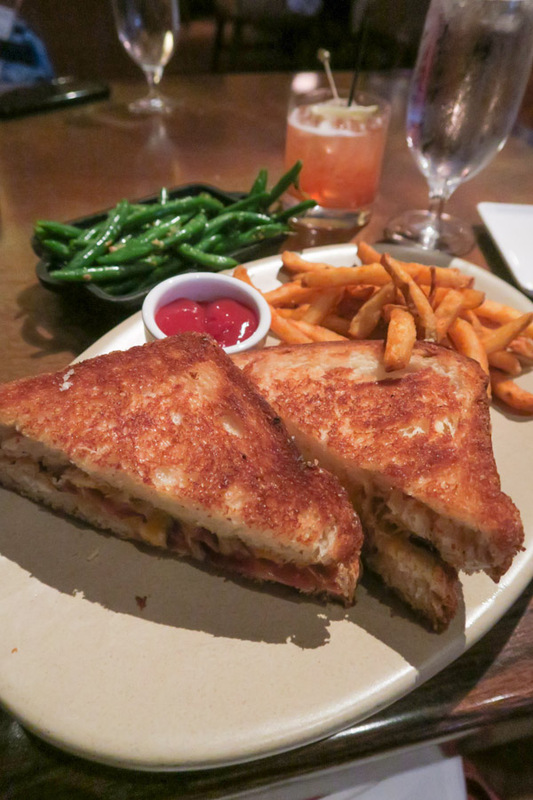 This version of grilled cheese has crispy pancetta inside in addition to a mixture of cheeses. My body was craving veggies, so I got a side of green beans too. I only ended up eating half of them but was able to save the other half for lunch the next day. 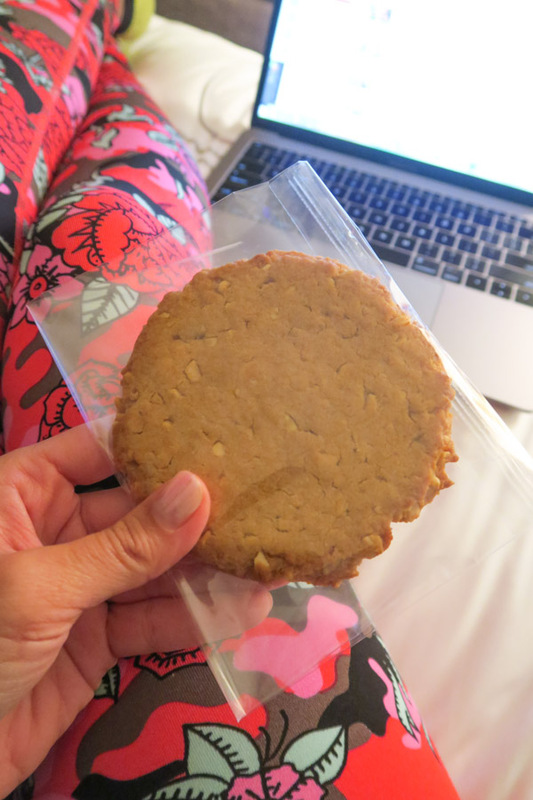 And for dessert I had half of this peanut butter cookie that I picked up at the marketplace. If you enjoyed this post, please share it with your friends because that will really support my blog and YouTube channel!